The idea of balance in food is simple to understand. It’s when two or more flavours come together to create a dish that is interesting to eat. It can be tastes that play an equal role in a dish or complimentary elements that reign in a more dominant flavour to make it less harsh & overwhelming. However to actually execute a well balanced dish can be challenging. I’ll be honest it took some time for me to appreciate why I liked certain dishes and realized it was balance. In retrospect, it might be the reason why we no longer like the foods we did when we were kids. Our childhood favourites tend to have one strong flavour, usually sweet. When we grow up, our palates develop and are nurtured to detect more flavours, as a result I think we want more interesting and balanced tasting food. Our tongues can only detect 5 tastes (salty, sweet, bitter, sour, and unami/savoury) but when combined with our sense of smell we actually can detect more flavours such as spicy and fat. I think sweet, bitter, sour, fat and spicy are the key flavours to pay attention to and harmonize in any dish. The inclusion of fat as a taste may seem unusual but enough fat makes a dish creamy and delicious but too much of it can cause a dish to be heavy and unappetizing. Much like the other tastes, the amount of fat in a dish needs to be controlled and as result it’s important to consider. 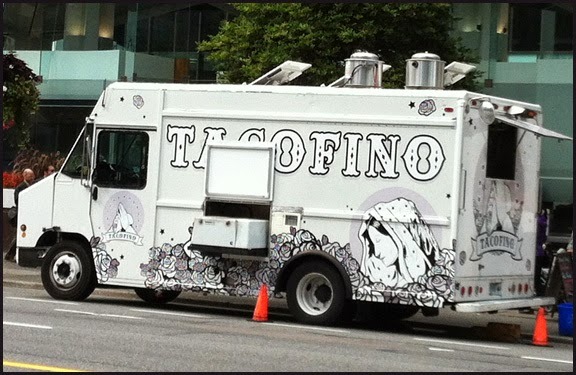 The reason for my discussion of balance were my visits to Tacofino’s new truck White Lightning. This monochrome truck replaces the popular Tacofino Blue truck, which now calls Victoria home. What sets this truck apart from the original Orange truck is it features Chicken Karaage and burritos. You can get the Chicken Karaage in 2 forms: in a soft shell taco or in a burrito. Unfortunately both items lacked balance. The Chicken Taco was garnished with guacamole, radish slices, chopped cilantro and green onions. Dark meat chicken was used; as a result it was flavourful, seasoned well and crispy. However since it was deep fried, the chicken added an oily taste and along with the creaminess of the avocado made the taco heavy feeling and monotonous. The veggie garnishes were unable to brighten up or add differing flavours to help balance out the fatty taste in the taco. The Chicken Kaarage burrito faired a little better but also had similar issues as the taco. The toasted wrap contain 4 pieces of chicken, rice, guacamole, black chili oil, cabbage, cilantro and Sriracha sauce. The rice and cabbage provided contrasting texture but little flavour to the ensemle. Thanks to the chicken and guacamole, the burrito was just too rich tasting. It was marginally better than the taco because the Sriracha sauce added a bit of spiciness and tanginess to the burrito but more contrasting flavours were needed. Although the Chicken based offerings were off balance, the fish burrito was well balanced. The various ingredients provided differing flavours that work harmoniously with one another. The ling cod itself was sweet, the crispy slightly oily batter surrounding the fish gave a crunchy texture, the black beans added a savoury aspect, the chipoltle sauce provided a layer of creaminess and the tomato salsa created a tart flavour profile. Much like the other burrito, rice and cabbage provided texture. All different parts of the fish burrito brought something to the table but didn’t overwhelm one another. Since everything worked well together, the fish burrito was a very tasty and worth repeat visits to the White Lightning truck. Balance is not just for high end dining. Even with street fare like burritos, if you can combined differing flavours in the right proportions fabulous food can be had. If you are interested in the science behind how we taste food, I recommend an article called, “Making “Sense” of Flavor: How Taste, Smell and Touch Are Involved” by Amanda Greene. Also I couldn’t resist embedding the following video because a truck called White Lightning and serves deep fried food in my mind should really be called, “Greased Lightning”. Hope you enjoy.